Does anyone else feel challenged keeping up w/ vendors, regulations, alliances, pilots and investments in the mobile space? As I get older, my tendency is to categorize and sort for storage in my decaying gray matter. Upon encountering a new idea, I’m fortunate to have some very good friends to help me analyze it and assess it. I’ve certainly learned that my ability, to categorize and sort in isolation, has a very high error rate. The added benefit of conversation is to further the human network (as I can depend less on my decaying neural one). Even these diagrams are not comprehensive as they fail to take into account such things as microfinance (unbanked/underbanked), regulatory issues (cross border, AML, KYC), consumer protection, carrier dominance, credit bureaus, merchant POS infrastructure, customer education, broadband/3G availability, …etc. After speaking with over 50 start ups globally (and several VCs, FSIs and MNOs), my opinion is that mobile payments is likely to stay “regional” for the next 5-10 years. Success will be driven by well established, trusted companies with an existing mobile/financial network or with large payees/beneficiaries (government, transit, retailers, …) capable of creating a critical mass of consumers with a strong convenience play (ex. HK Oyster Card). Within Tier 1 OECD countries, there is opportunity in chaos. From a banking perspective, NFC integration into mobile handsets is the top global opportunity, with a significant consumer convenience play. The ability to pull out your mobile phone to pay at a cash register, open a locked door, store coupons, receive marketing, send money across the globe, and store all of your other “digital keys” will combine with the unique capabilities of mobile (location, always on, …) and financial services (demographic, spending ability, spending habits, …) to provide a tremendous “wave” of innovation, investment and M&A activity. Over the next 10 years, emerging markets will be riding an even greater wave as the absence of infrastructure is bridged by access to low cost mobile devices capable of providing both access to information and services. The developments here will likely take on a much different focus then developed countries, but with a much larger global impact on the quality of life of 80% of the world’s population. In the West we take for granted such basic infrastructure as: consumer protection, contracts, law and access to an unbiased judiciary. Given these challenges, concepts such as: “Trust” external to one’s community, and “banking” are foreign. The bank opportunity, in the developing market, is to leverage mobile as a platform to serve 600M-800M new customers over the next 6-8 year. There will likely be great differences in development of mobile payment between the developed and “developing” world, hence banks should strongly consider separating the responsibility for approaching them. Banks and payments, typically play an infrastructure role to commerce handling such things as authorization, clearing, settlement, reporting, … etc. Banks are uniquely chartered to serve this function and commerce is served by having a reliable, regulated entity responsible for the exchange values between parties. 2. What is the consumer value proposition? a. Why is it so urgent that the consumer cannot wait until they get home or office access to their computer? 3. What is the merchant value proposition? a. Competes or aligns with existing products? b. What current products target this consumer? c. What is transaction volume and growth? d. What is their primary market (ex PayPal – eBay) and are they expanding? e. Does it connect to an existing payment network? Who manages switch risk? a. What change is required? a. Who makes the rules? b. What is compliance burden? c. Who is responsible for compliance? e. Servicing: Who owns customer dispute/resolution? f. How are rates/fees set? Who negotiates them? g. How long has it existed? Fraud/weaknesses? a. Invested capital, valuation, BOD experience? b. How does it support Parent’s business model? What service does it provide that I can’t do today? The shocking result is that there were very differences in the results of our decision frameworks. The purposes of this Blog are: engage community in defining categories, increase investment (where appropriate) by assisting those with capital in their assessment, identify new opportunities in payments. 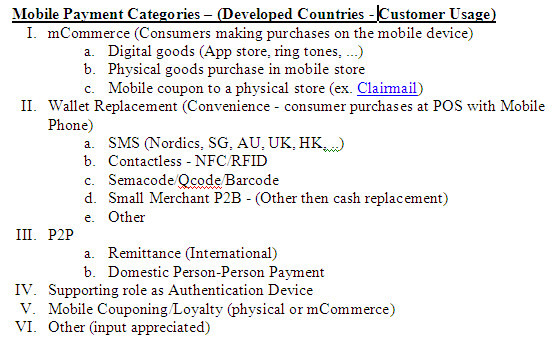 Categorization of payment schemes that do not fall into the categories above are challenging. Which attributes should drive the categorization? My tendency, in process of categorization, is to always segment based upon customer or customer usage. This approach leads to market quantification and I will proceed in this vein until it stops working for me. Separating the unbanked (above emerging markets), the draft category list is below. Yes this is too complex. Since I’m not writing a novel here I will focus on the ones which I’ve had some interaction, or which are exhibiting exciting growth trends. The complexity and potential for mCommerce is precipitating some very curious investment decisions, some of which can only be categorized as a “bet” that a team will “figure it out” sometime in the future (See Nokia-Obopay). Companies which are able to deliver a focused value proposition, build core competencies, partner, and adapt their plans will be best positioned to ride the storm. I’m attempting to take on the role of a weather forecaster, while investing in the areas that are likely to have the best harvest. Prior to reading any of further, perhaps I should state my “payment” assumptions that predicate many of the views to follow. Of course good people will disagree, and I appreciate the dialog. I. Banks compete where there is profit incentive, and there are very few “new” payment types where a bank cannot compete with an existing product. Retail Banks have 2 competing internal organizations: Banking and Card. Retail Bank earnings are tightly tied to the products that surround payment. II. Banks and MNOs are notoriously hard to partner with. There seems to be (at least) 4 communities that don’t collaborate frequently: Banks, MNOs, Start Ups/VCs, NGOs, … Each of these has their own (competing) objectives. III. The US payment market is much different than the rest of the world (not better). Add another dimension to the parties listed above. IV. Developing ecosystems will display much chaos before clear trends emerge. Chaos in payments is anathema to trust. Trust is necessary for mainstream customer adoption. V. The most successful non bank which has emerged in payments is PayPal, their success is due to their ability to focus. Initially on eBay, then leveraging its success and focusing on 2 unique “weakness” in card transactions: Card Not Present (risk management) and the inability of the existing Card network to adapt (complexity). VI. Silicon Valley hype machine surrounding mobile is in full gear. There are some gems, but hard to separate from the dirt. Most private valuations and M&A transactions to date have very little connection to reality. VII. Europe’s “success” in mobile payments adoption provides insight into profitability of the service(s). In almost every case, the margin opportunities exist separate from the transaction. This “evolved” ecosystem seems to model cash, particularly in the Nordics where Mobile Payments are becoming “ubiquitous”. VIII. Emerging market dynamics are completely unique, and there will be many unexpected “leap frog” developments as business, technology, financial services and regulations adapt to serve the world’s developing nations. Any broad categorization of these opportunities is difficult separate from the market dynamics (Example Vodafone has an 80% market share in Kenya that drove MPesa). IX. US MNOs are working to define how they can take part in transaction revenue (e.g. control). International markets are much different. For investors assessing start ups attacking the confluence of “payments” and “mobile”, historical view of past transactions and investments is of little value. In the US, the big players (MNOs and Banks) have not acted yet, and when they do it will impact every mCommerce company in your portfolio. Take a look at Japan, HK, Nordics, SG to see alternate visions of what the future could hold. Ensure the prospect has a sustainable value prop in the current market, and a management team capable anticipating market moves to adapt it. MobileMonday provides an excellent overview of the current deal flow in mobile. A few select transactions are listed below (further detail is available). It is apparent (from the complete data set) that capital raising valuations for “mobile services” have very little basis. FT Partners provides an excellent detailed look at M&A activity in financial services space, and should be considered when evaluating mobile money investments.